1) Start with the cursor on Desktop Monitor 1. 2) Move left to the Laptop secondary monitor. Everything is fine so far. 3) Continue moving left to the laptop's built in screen. As you move leftward across the screen, the cursor will jump back to the laptop's secondary monitor. This jump occurs when you cross approximately a quarter of the screen, and the position it jumps to is about a third of the way from the left of the laptop secondary monitor. 4) If you continue moving left and make your way to the laptop's built in monitor everything is fine now. It can move around without issue. To more clearly illustrate what I'm describing, I drew a little picture in MS paint of what's going on. Imagine I move my mouse to the left until I hit the far left edge of the screen, then start moving right to get back where I started. 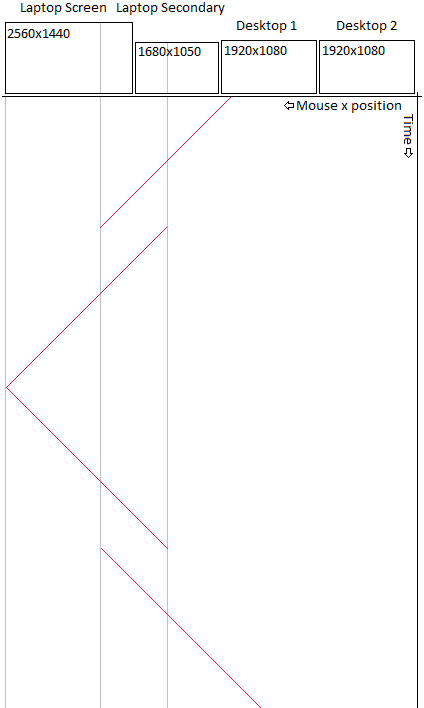 I graphed the x position of the on screen cursor over time showing where the jumps occur. I have the same problem. Did you ever get this sorted out?